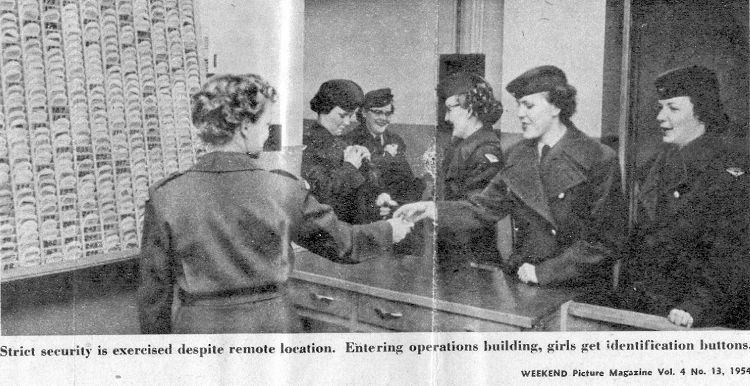 RCAF Airwomen held their fifth reunion in Halifax in 2001. An extremely dedicated group laboured long and hard to produce a 150 page book called "50 Years RCAF Airwomen 1951-2001". I was fortunate enough to have been provided with a copy of this book (my thanks to Ghyssie Thibeault (now MacNaughton)). 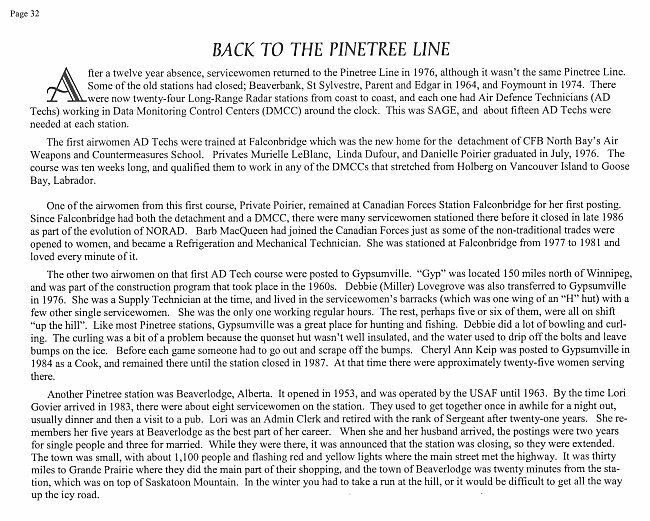 In keeping with the intent of this section, I have processed a portion of the book that provides detail on Airwomen within the Pinetree Line. 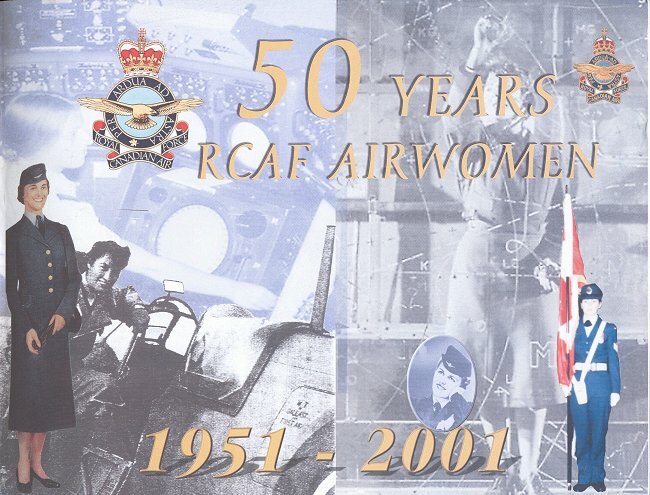 50 Years RCAF Airwomen, Front cover - 2001. 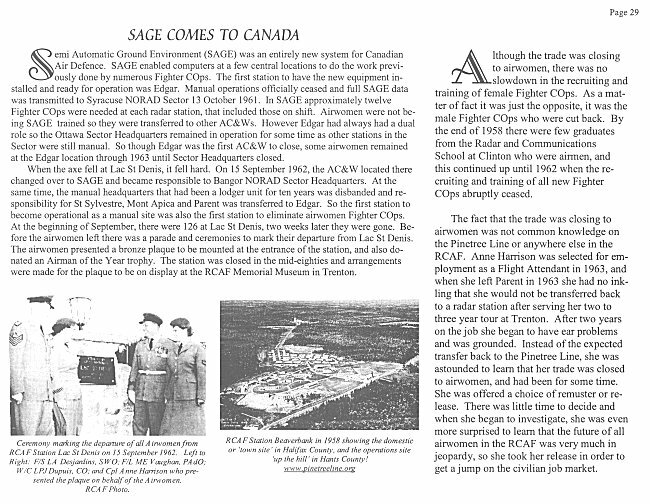 50 Years RCAF Airwomen, page 21 - 2001. 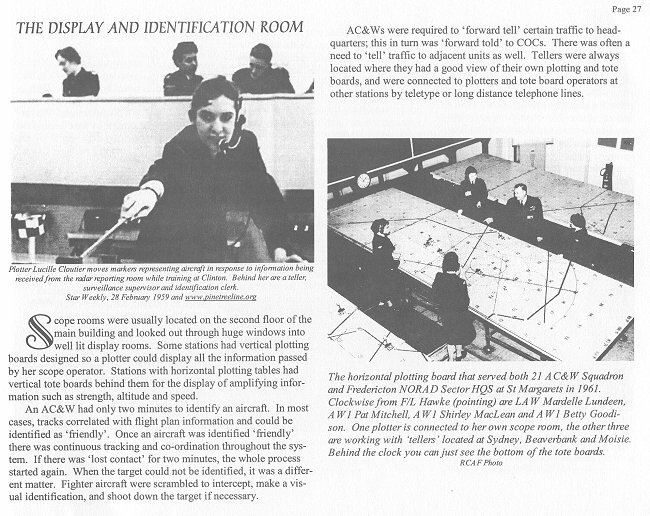 50 Years RCAF Airwomen, page 22 - 2001. 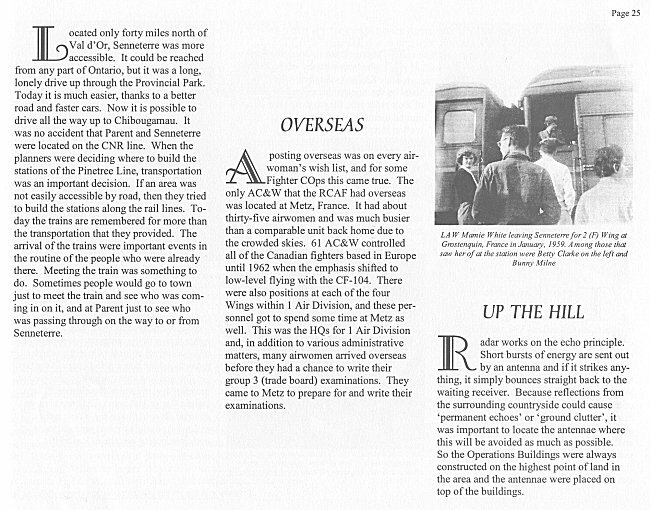 50 Years RCAF Airwomen, page 23 - 2001. 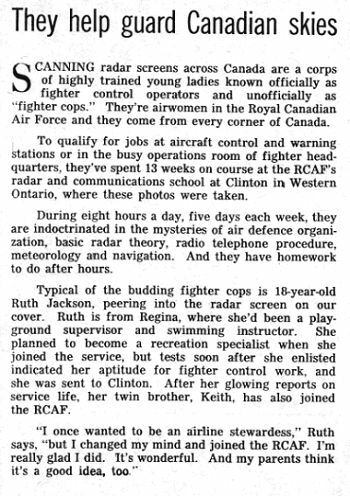 50 Years RCAF Airwomen, page 24 - 2001. 50 Years RCAF Airwomen, page 25 - 2001. 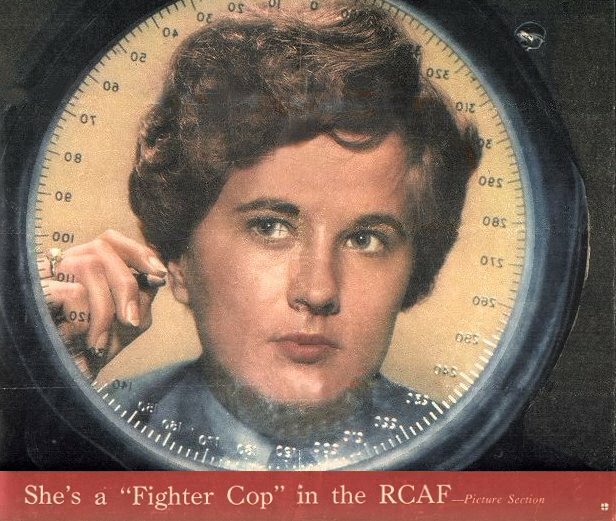 50 Years RCAF Airwomen, page 26 - 2001. 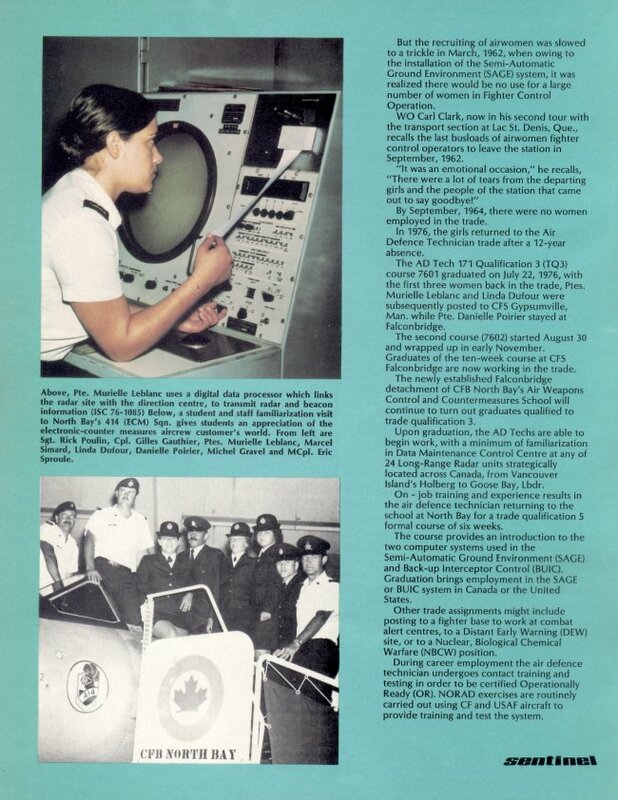 50 Years RCAF Airwomen, page 27 - 2001. 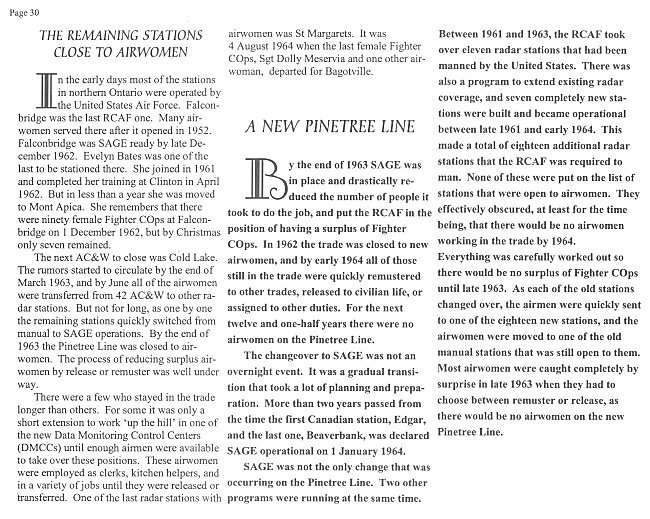 50 Years RCAF Airwomen, page 28 - 2001. 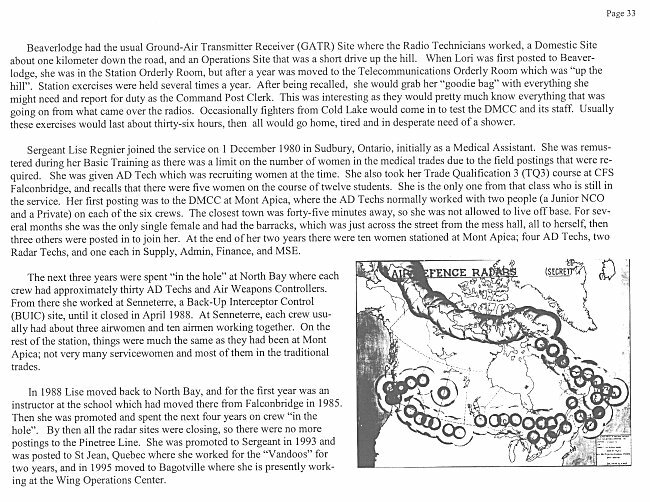 50 Years RCAF Airwomen, page 29 - 2001. 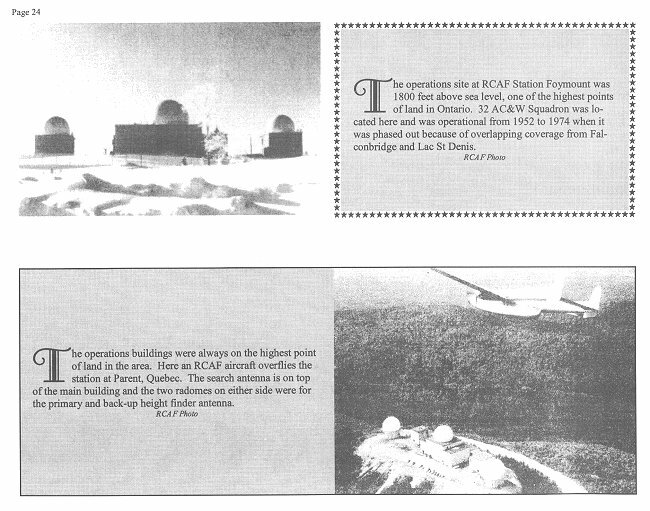 50 Years RCAF Airwomen, page 30 - 2001. 50 Years RCAF Airwomen, page 31 - 2001. 50 Years RCAF Airwomen, page 32 - 2001. 50 Years RCAF Airwomen, page 33 - 2001. 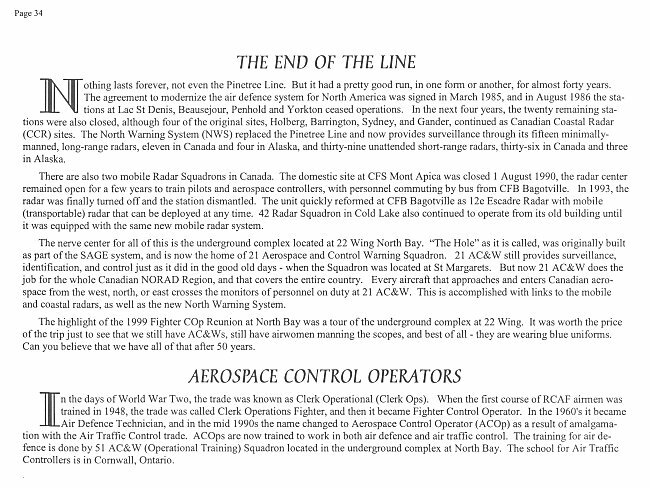 50 Years RCAF Airwomen, page 34 - 2001. Penny King - With the intoduction of SAGE in Canada, there were no female FCOs (FtrCops) working in their trade on the Pinetree Line by the end of 1964. 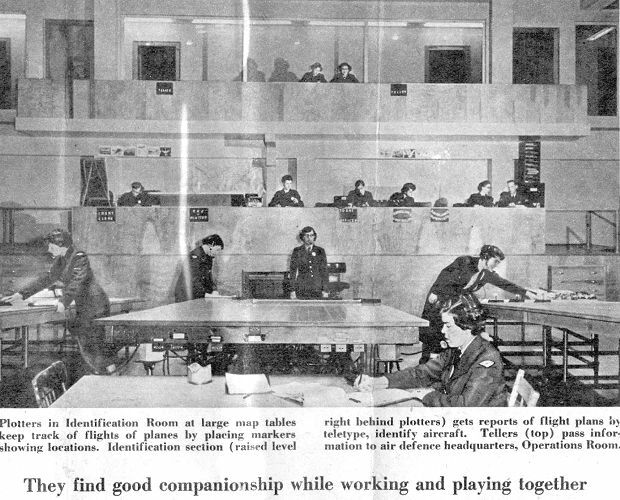 It appears that the female FCO was not totally eliminated in 1964 - but that the RCAF cut down the female FCO positions to a very small number. Detail from NDHQ indicates that there were still 19 female FtrCops in March 1966 - and some of these were serving as Flight Attendants - not a remuster - but a one time posting. 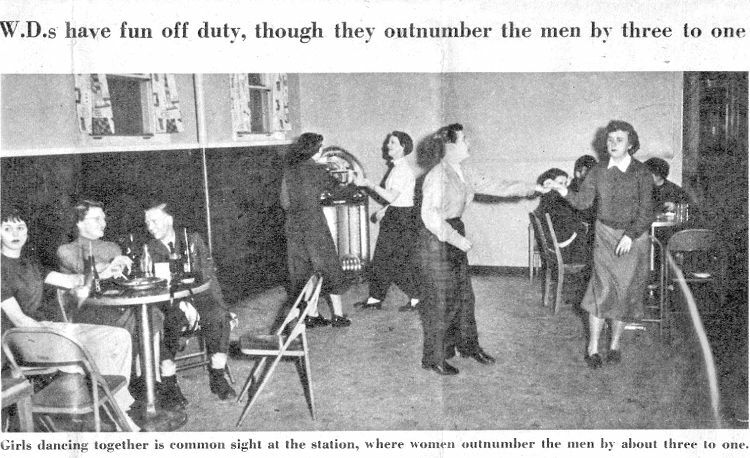 These women were supposed to return to their original trade (FCO) after one tour as a Flight Attendant. It is hard to believe but neither the female FCOs nor their supervisors in Trenton realized what had happened until mid 1965 when one of the female FCOs - serving as a Flight Attendant - lost her medical category and they asked AFHQ to return her to the Pinetree Line. It was quite a shock for everyone to hear that she had to remuster to Supply or take her immediate release. The Sgt who closed St. Margarets for us was posted to Bagotville on 4 Aug 64, and she worked there in 3 Hangar until late 1966. I got lost in the shuffle at Cold Lake in late 1963, and I think I could have stayed there without remustering until the end of 1966 if I hadn't pushed for a voluntary release - so I suspect there may have been a few others in that same category. 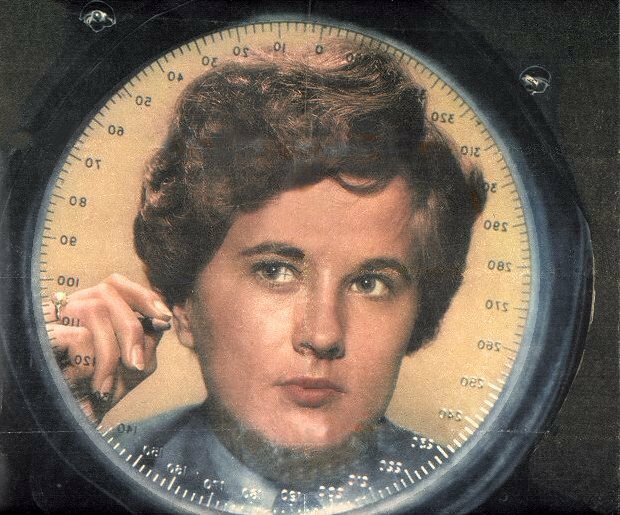 I know that some female FtrCops stayed in the trade long enough to become AD Techs - including two who were CFR'd in mid 1967. 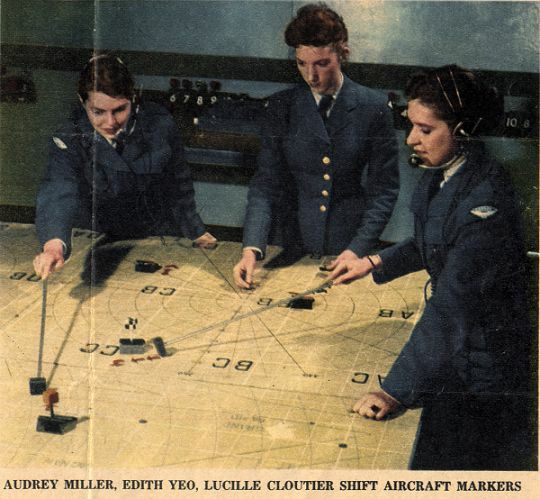 The absence of females actively working as FCOs lasted for twelve years (1964-1976), when the female returned to the trade, then known as Air Defence Technician (ADTech). 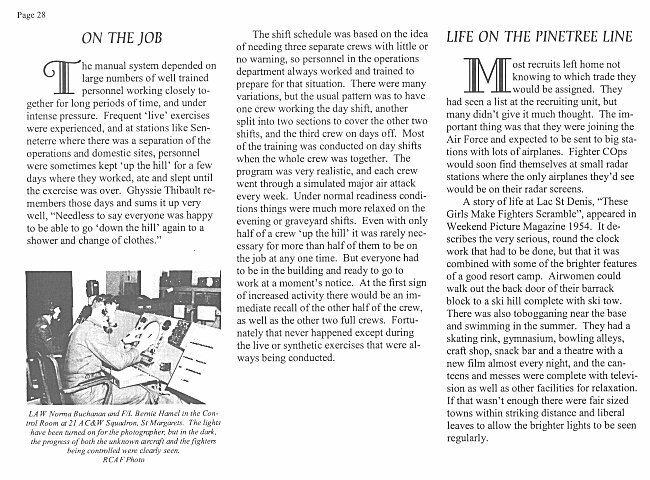 This return was carried in the 1976/7 issue of the Sentinel magazine which was made availble to the Pinetree Line web site by Richard Poulin. 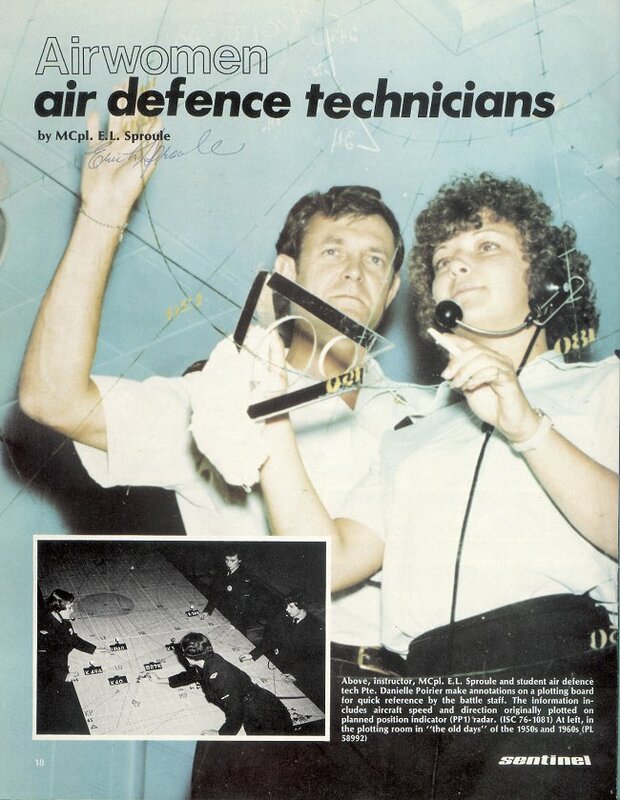 Airwomen Air Defence Technicians, page 1 of 3 - 1976. 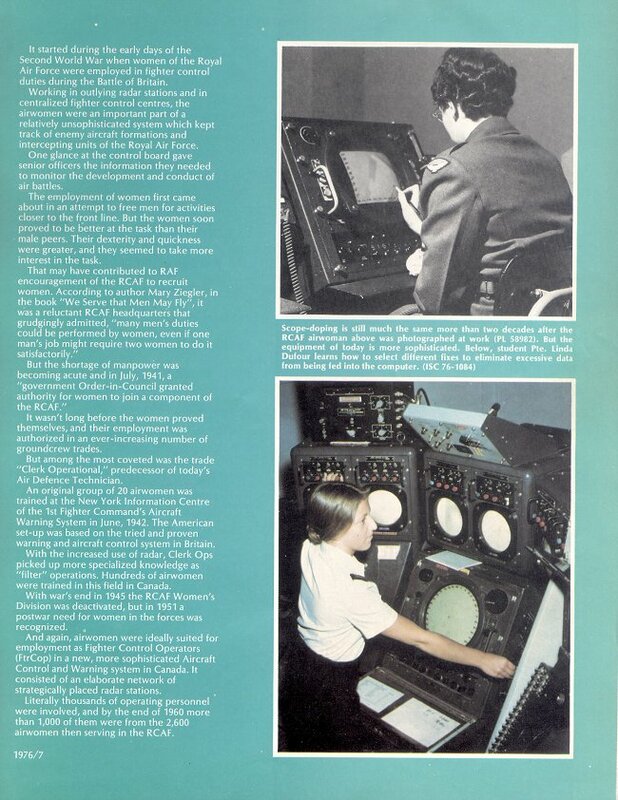 Airwomen Air Defence Technicians, page 2 of 3 - 1976. 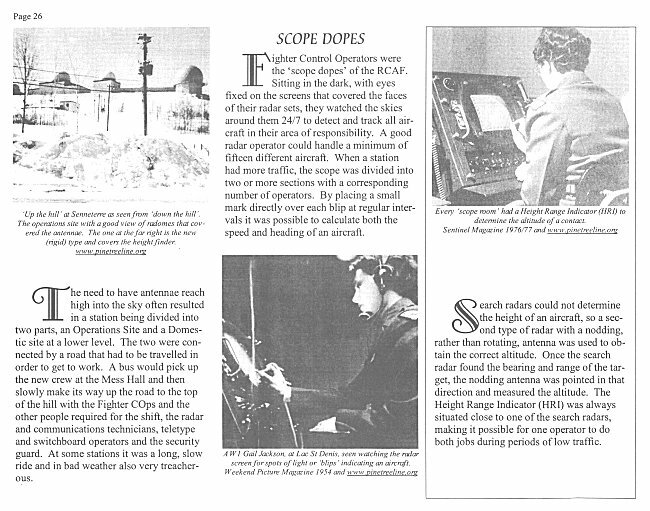 Airwomen Air Defence Technicians, page 3 of 3 - 1976. 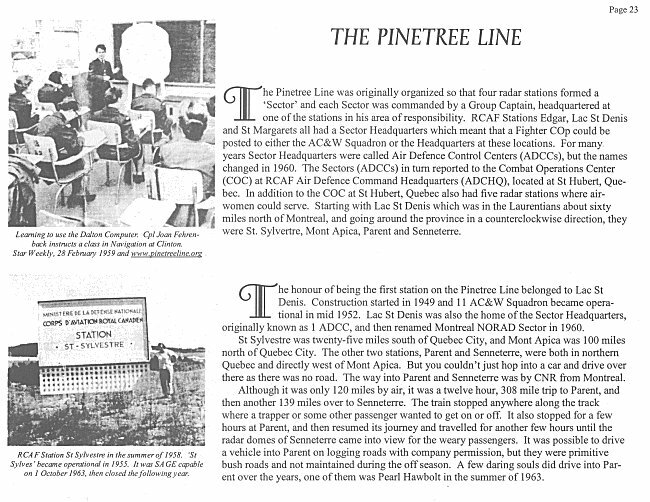 There have been many articles written in newspapers and magazines about the Pinetree Line over a 40 year span. 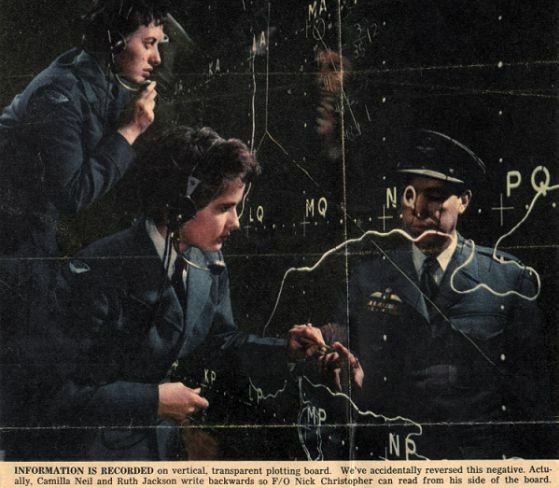 One of the most informative, from a female "Fighter Control Operator" point of view was a three page spread in the February 28th 1959 edition of the Star Weekly. 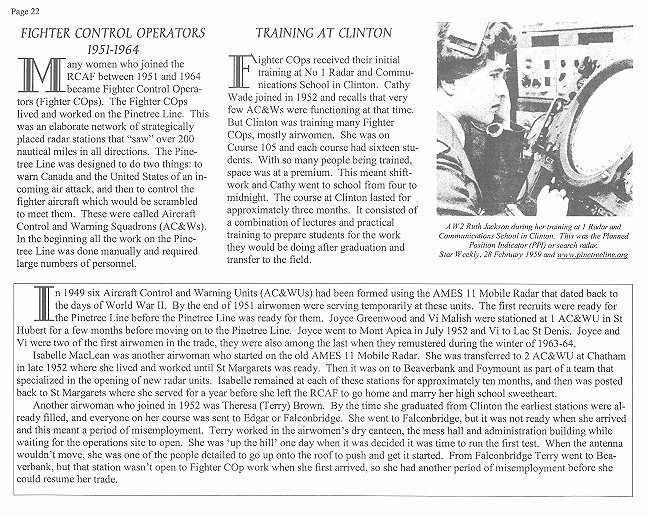 This issue of the Star Weekly carried an extensive article on Airwomen training as Ftr Cops in Clinton. 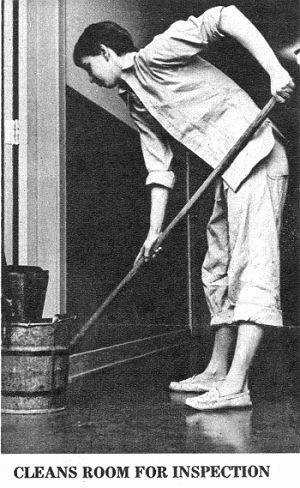 The main subject was a young trainee by the name of Ruth Jackson – and the article carried a number of photographs that related life "at work and at play". 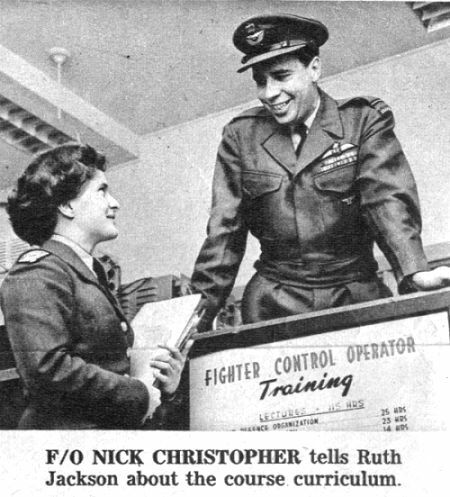 Ruth Jackson graduated from her FCO training in March 1959. Front page of Star Weekly magazine - 28 February 1959. 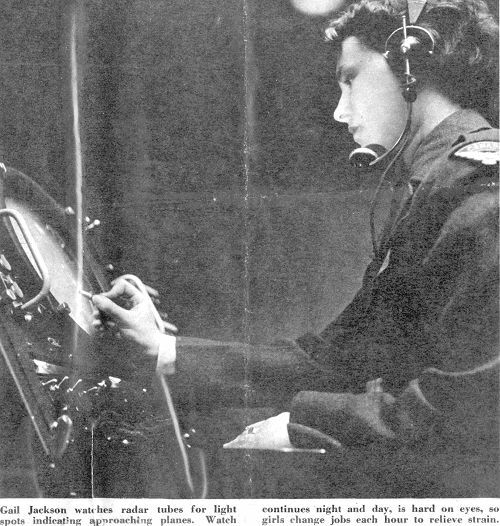 Ruth Jackson in front of radar scope on front page of Star Weekly magazine - 28 February 1959. 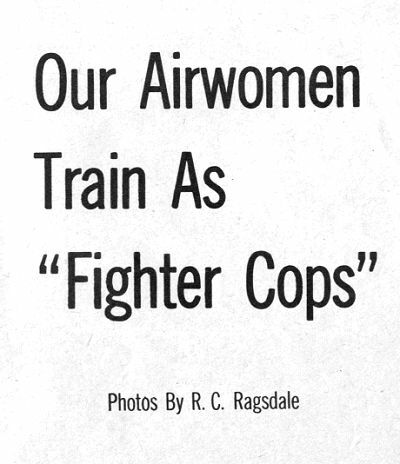 Header of article on Airwomen training as Fighter Cops - 28 February 1959. Camilla Neil and Ruth Jackson working on vertical plotting board - 28 February 1959. Audrey Miller, Edith Yeo and Lucille Cloutier working on horizontal plotting board - 28 February 1959. 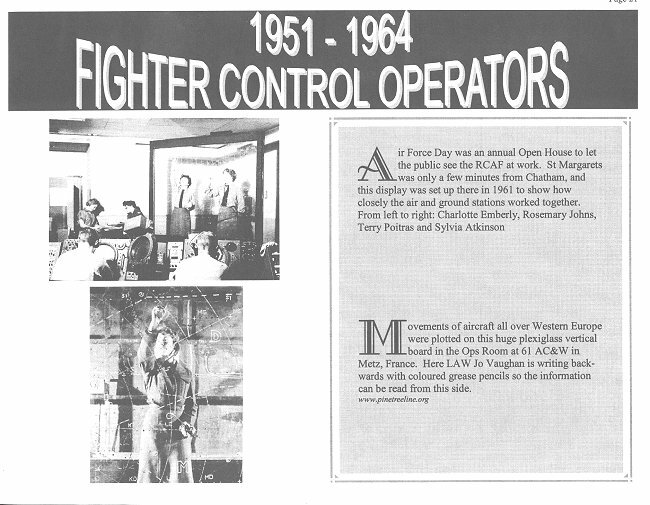 Short article on Fighter Cop training - 28 February 1959. A typical evening during off duty hours - 28 February 1959. Still some work to finish - 28 February 1959. 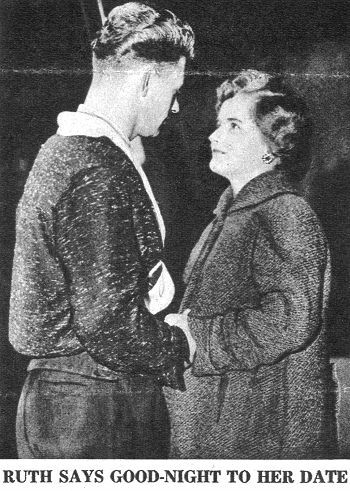 Ruth Jackson at the end of a date - 28 February 1959. 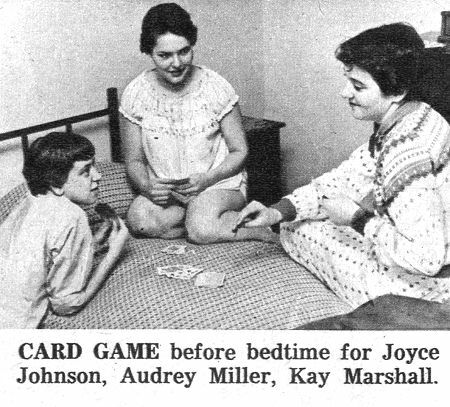 Card game before bedtime for Joyce Johnson, Audrey Miller and Kay Marshall - 28 February 1959. Ruth Jackson sleeps in - 28 February 1959. 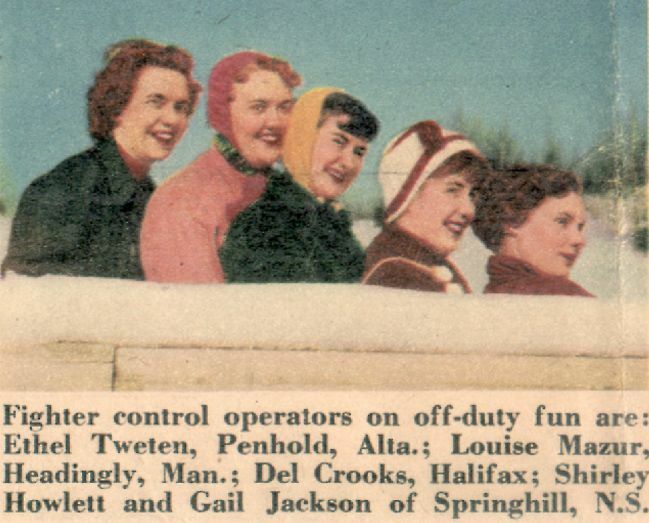 Short article "Good Pay and Lots of Fun" - 28 February 1959. Ruth Jackson obtains course information - 28 February 1959. 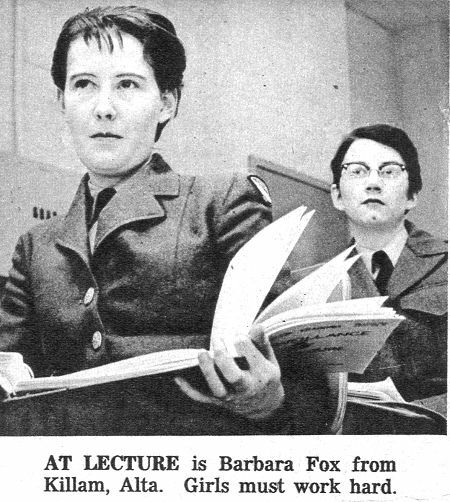 Barbara Fox and Marion (Mickey) Scheers attending a lecture - 28 February 1959. 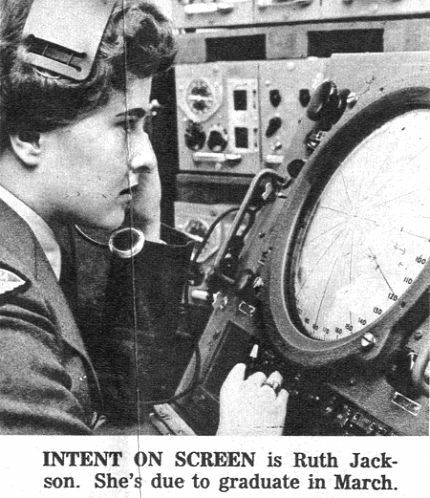 Ruth Jackson working at radar scope - 28 February 1959. 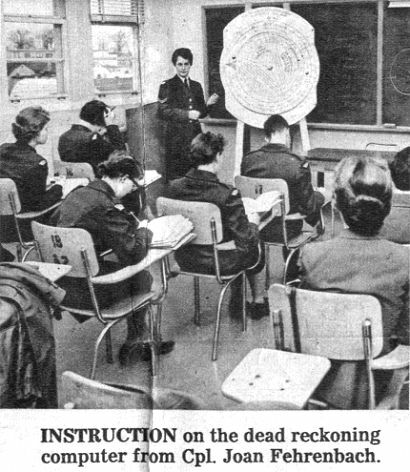 Lecture on "Dead Reckoning" with the Dalton computer - 28 February 1959. 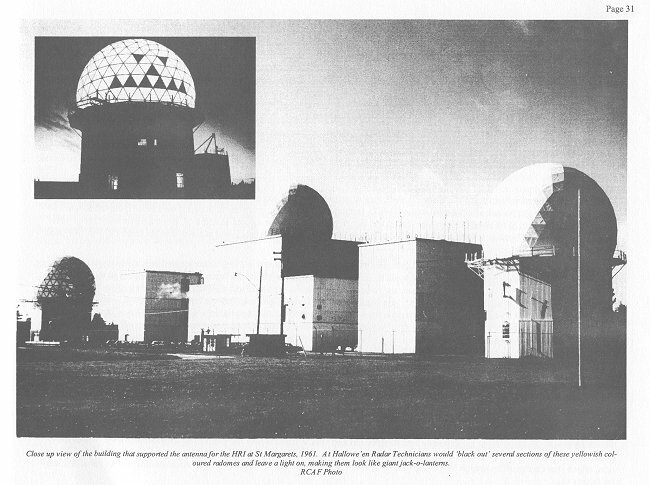 More work on radar scope position - 28 February 1959. 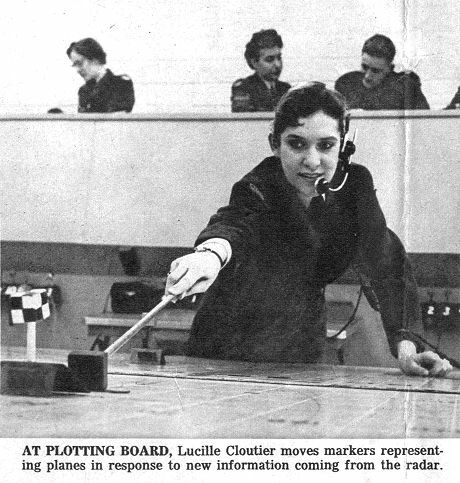 Lucille Cloutier making at work on the horizontal plotting table - 28 February 1959. The Weekend Picture Magazine Vol. 4, No. 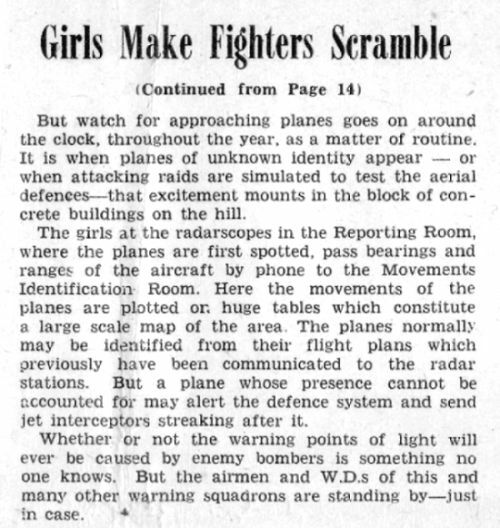 13, 1954 carried a three page spread under the title "These Girls Make Fighters Scramble". 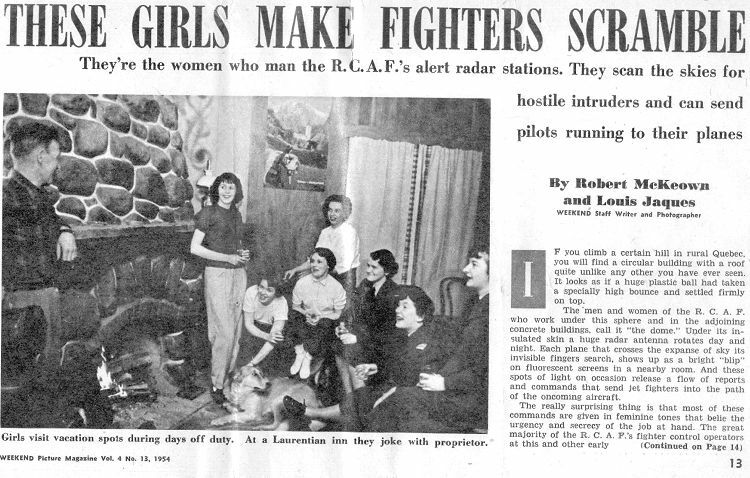 The main theme of this article is centered on the number of female Fighter Control Operators which were employed at RCAF Station Lac St. Denis (they outnumbered the men by three to one). This information was provided to the Pinetree Line web site by Margaret Jones (now Renaud). 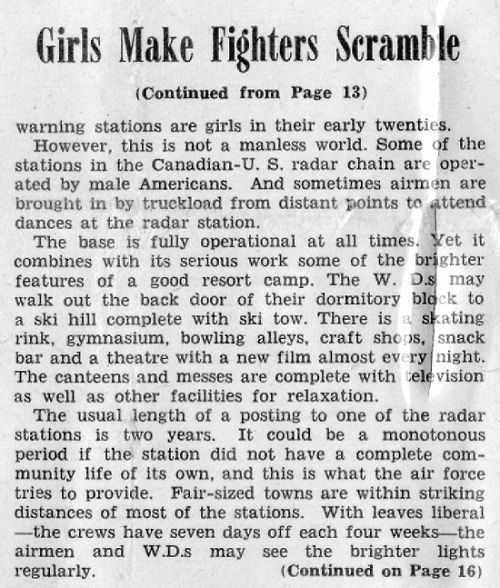 "These Girls Make Fighters Scramble" lead article - 1954. Page two of lead article - 1954. Page three of lead article - 1954. 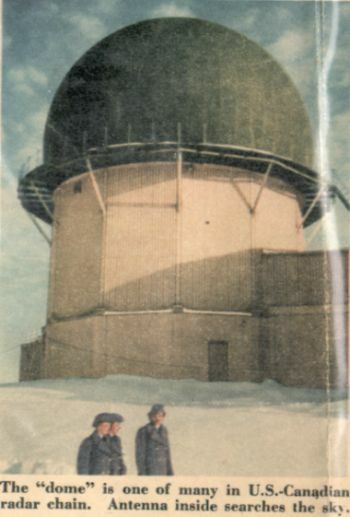 Radar tower and radome - 1954. Security passes required for access - 1954. 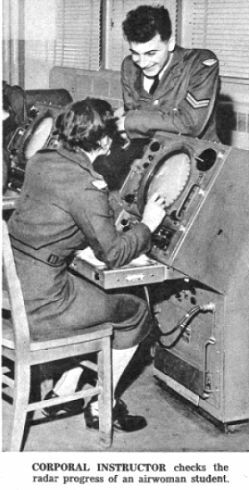 Gail Jackson in front of radar scope - 1954. 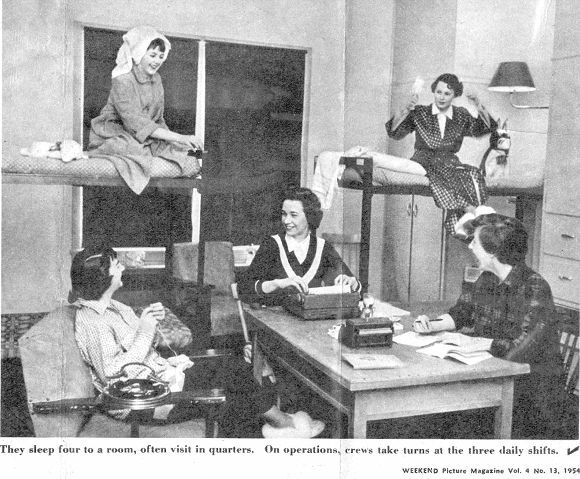 Off duty FCO's - 1954. 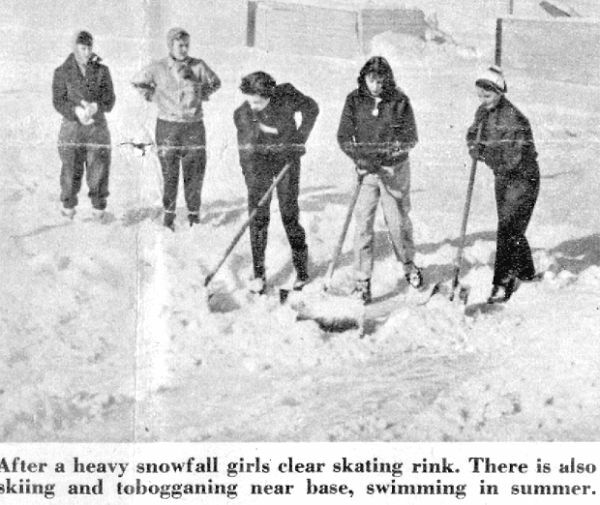 Clearing snow from the outdoor skating rink - 1954. 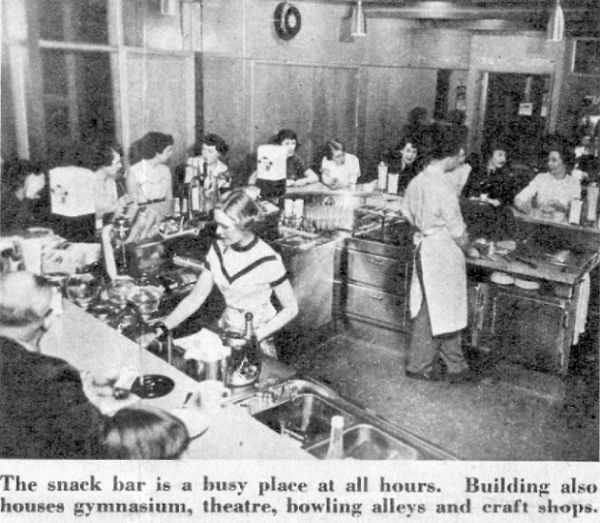 Snack bar is a popular location - 1954. 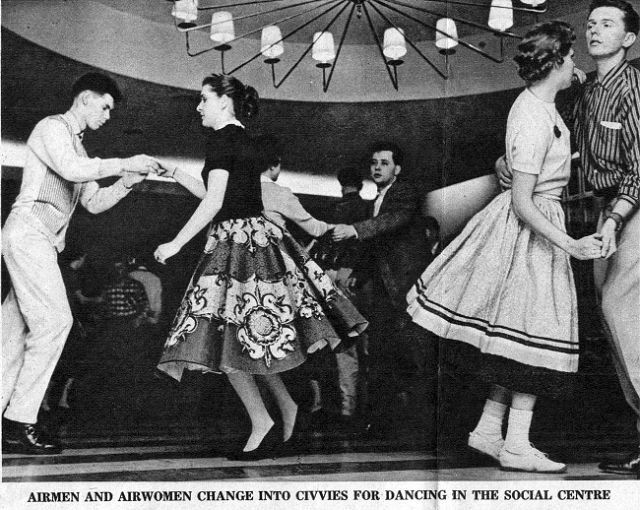 Dancing in the club - 1954. Additional material pertaining to female FCOs graduating from Clinton are processed and added to this section of the web site. 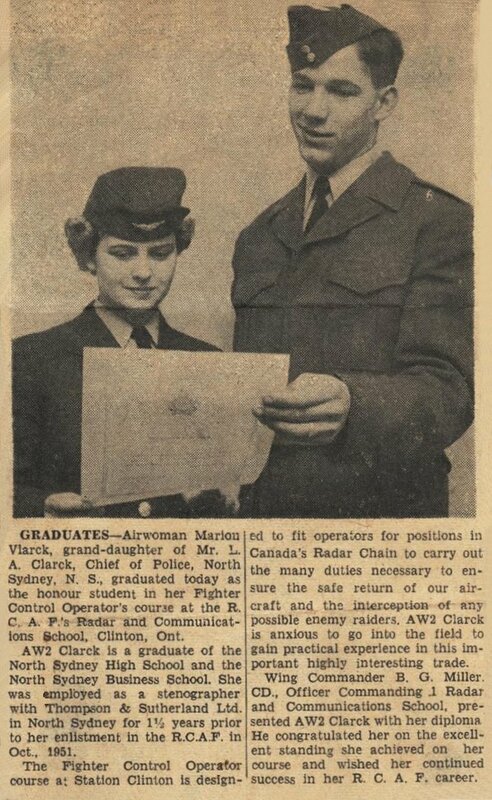 AW2 Marion Clarke graduates from the FCO course in Clinton - February 1952. Newspaper clipping 204K. There are errors in this report. The correct spelling of the Airwoman's name is "Marion Clarke".